Alumasc's BluRoof is a BBA approved single source waterproofing and sustainable drainage solution which is covered by an Alumasc single point warranty. Alumasc's proven knowledge and experience not only within the roofing industry but drainage also gives Alumasc a unique advantage by being able to provide all components involved in designing a successful blue roof from one, single source. This historic partnership between Alumasc Roofing and Drainage Divisions is, we believe, integral to the success of a roofing system of this nature and backed up by the single source warranty provides the customer with ultimate peace of mind. The dual-reinforced BluRoof built-up high performance membrane is specified as a fully bonded system, with extended and high-pressure rolled laps for excellent watertight integrity. The waterproofing layer has a mineral free surface which reduces the risk of blockages. For inverted roof applications, including green roofs and podia, Alumasc’s BluRoof monolithic membrane forms the waterproofing layer upon which Alumasc insulation, BluRoof separation layer, BluRoof VF50 void former and surface finish are applied. For buried (non-insulated) systems such as podium applications, Alumasc’s BluRoof monolithic membrane provides a self-healing waterproofing solution that is free from laps. The BluRoof VF50 void former and surfacing are then applied, as with the inverted roof solution. A root-resistant version of the BluRoof bituminous membrane is available for compatibility with Alumasc’s Blackdown green roof systems. Harmer BluRoof Outlets restrict the maximum permissible discharge of stormwater by the inclusion of a restriction device that is removable for maintenance and adaptable to future climate change. 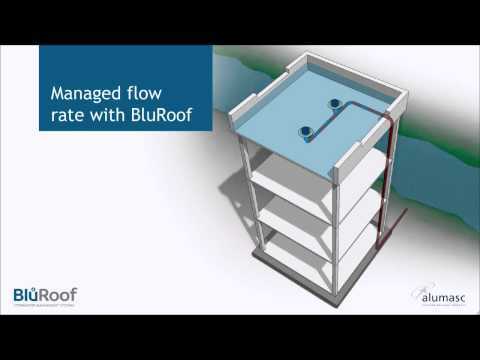 How does the BluRoof system help to alleviate flood risk? Alumasc’s BluRoof system reduces and controls the peak rate of stormwater discharge from roof areas. Detention of stormwater up to a prescribed maximum hydraulic head occurs, with subsequent discharge controlled over an elongated time period.